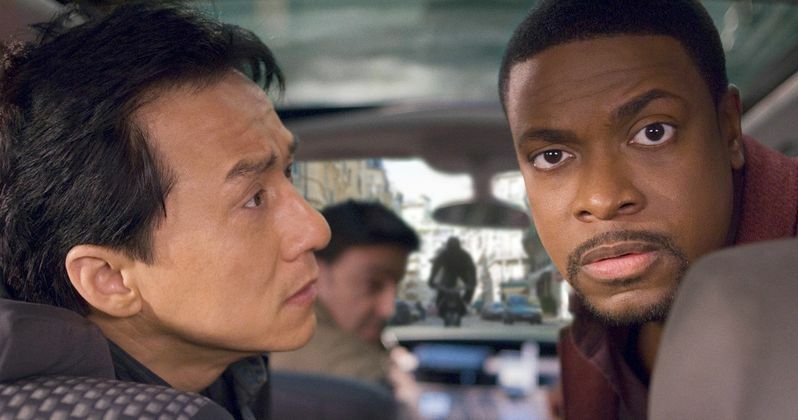 More than a decade later, Chris Tucker is ready to get back together with Jackie Chan and Make Rush Hour 4 happen. The duo first united for Rush Hour in 1998, which was a huge hit at the box office and is to this day one of the things Chan is most well known for in the U.S. It also easily remains Tucker's most bankable role ever. After years of waiting, it looks like everything is coming together as Tucker has just confirmed that Rush Hour 4 is indeed happening and sounds quite confident it's not only going to happen, but that it's going to be great. Chris Tucker recently appeared on ESPN's The Plug Show and the subject of Rush Hour 4 inevitably came up. When it did, the comedian and actor revealed the good news and confidently stated that the movie is moving forward. He continued, saying that everyone is ready and that they're doing this so "people won't ever forget it." Here's what he had to say about it. "It's happening. This is gonna be the rush of all rushes. Jackie is ready and we want to do this so that people don't ever forget it." That sounds definitive and positive, which is good for those who want to see Rush Hour 4. We also already know that Jackie Chan is on board and ready to go. Last year, while promoting his movie The Foreigner, Chan revealed that the script was being worked on and that he was meeting with "the director" and Chris Tucker about it to make sure everything was heading in the right direction. So both of the people absolutely needed to make this movie happen are on board. Since Jackie Chan said this back in October, it's safe to assume that if the script isn't done by now, it's at least much closer to being ready. As for the unnamed director, it's fairly safe to assume they were talking about Brett Ratner, who directed all three previous Rush Hour movies. However, Ratner came under fire last year after being accused of sexual misconduct and he had to be removed as a producer from Wonder Woman 2 so that Gal Gadot would return. With that in mind, it's doubtful that he would return for the fourth and presumably final installment of the franchise. The Rush Hour movies have made a combined $849.7 million at the box office. For Rush Hour 4, the trick will be to keep the budget under control. Rush Hour 3 may have made $258 million, but the $140 million budget kept it from being a hit in any way. As for when we can expect to see this happen? That's tough to say, but Chris Tucker doesn't act as much these days, so it's probably got a lot more to do with clearing Jackie Chan's schedule. For more with Chris Tucker, you can check out the latest episode of The Plug Show.